Bringing water to villages means that the community can grow market garden produce, thereby improving its food safety and producing revenues. Thought should be given to a certain number of questions before starting. This sheet indicates this and suggests solutions. The next sheet E 51 "Irrigation systems for vegetable gardens and market gardens" indicates more precisely the particularly serious problems of looking for and using the water and potential solutions. Market gardening has developed tremendously over the last thirty years. It attracts different types of player : private individuals, family or neighbour groups, village and district communities, etc. as well as groups of women or young people and schools creating small educational school vegetable plots. Market gardening can therefore vary tremendously, from a few tens or hundreds of m2 to several hectares. Market gardening is a good way of improving the diet of populations, ensuring their food self-sufficiency and providing additional revenue as well as promoting social and community activities. This type of activity can be financially profitable and improve considerably the economic situation of communities involved, but it is not always simple to introduce and demand some prior reflection. This is most often families, groups, communities or schools in rural areas and also sometimes on the outskirts of towns. 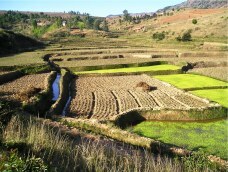 To have any chance of succeeding with a vegetable plot or market garden (photo in Madagascar, which to simplify things will now usually be referred to by the same name of "market garden"), it is highly advisable to give the matter some thought, as indicated in a very interesting PS Eau (Programme Solidarité Eau, Paris) study which has inspired this sheet (access link below), and to refer to the following different points. a) Why and for whom should a market garden be planned ? Before launching into creating a market garden, it is important to ask firstly a few questions on the expectations from it. Firstly, is the garden produce intended mainly for personal or family consumption or to be marketed ? Is the creators’ aim basically food-related or social (feed a family better or do it in a community, thereby developing social or educational activities) or is it basically economic ? The answer to this question will provide the basis for reasonable investment, mainly in terms of pumping and irrigation. For produce intended for personal consumption, an effort will be made to reduce the operating costs as much as possible whereas from a commercial perspective, part of the obviously anticipated income could be set aside each year to reimburse larger investments. But make sure you study the local market garden produce market well in advance. It is also important to design the project to reflect on who will be the players in this market garden production and their number, how much time they can devote to this work and the total workload represented by the cultivation of the garden that they can realistically take on. For example, in a community of women, there is normally abundant but fairly unavailable manpower, which limits the surface cultivated to a few tens of square metres per person. 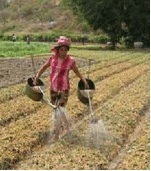 In any case, it appears that whatever the size or surface area of the market garden, a project to create one can only be viable if the huge physical and financial efforts made by their players are rewarded by sufficient results, be they in terms of production, sales or the interest of social activities created. b) How is the vegetable plot or market garden designed ? This obviously depends on the crops you wish to grow and the quantities you wish to produce, but to create a market garden you obviously need land and water. There is not normally a lack of land but water is an essential factor in market garden production. The garden design should therefore be based on the amount of water available every day for irrigation and how far it is from the supply source, especially if this is not in the garden and the water has to be fetched on foot or with tanks. Pay attention also to the duration of the water availability period. If there is normally a lack of water at certain times, it is important to plan for this and only grow produce that can manage without it outside these periods. Some projects have in fact failed due to insufficient water supply for only a few weeks. 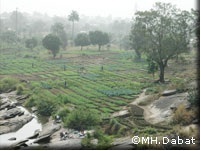 For market garden produce, the rule of thumb is 60 to 80 m3 of water available per hectare and per day. c) What are the impacts of miscellaneous water supply sources ? Independently from the garden design, the depth of the water point and its distance from the garden are also important parameters as they dictate the cost of pumping and transporting it. 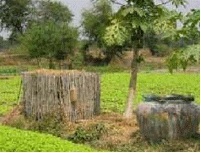 Similarly, the types of available water point can limit and even prevent growing certain crops. Please refer to the next sheet E 51 for this. It is important to let people organise themselves but by mutual agreement before the garden is even opened. The question of plot distribution and work division must be agreed in advance : what surface area for each individual ? who will be the treasurer ? the caretaker ? responsible for the pumping ? Who will be paid, if appropriate, and how ? Training issues are also very important. To avoid gardeners becoming discouraged from the start due to lack of experience, it is advisable to offer them some training even before the garden is open and also afterwards. The players will thus benefit from a certain experience when they start to cultivate. Exchanges with and visits to other producers in the region is also a good way of sharing experiences, avoiding errors and starting up the project in good conditions. Regardless of how the garden operates, special attention must be paid to selecting and purchasing necessary products (seeds, manure, fertiliser, treatment products, etc.). Good production requires first and foremost good seed. Seeds are the basis of the garden production : do not try and save money here for you could be risking bitter disappointment, both in product quantity and quality ! Quality selected seed, even if slightly more expensive and chosen with the help of a specialist, are worth far more than any found yourself cheaper from small suppliers or salesmen who do not really understand the business. But sowing is not enough. The plants need to find the nutrients they require in the soil and will only produce a good yield if the soil quality is good. It is therefore essential to maintain soil fertility for the success of the market gardening project. Fertilisers can be used but they are expensive and natural fertilisers, mainly manure or compost, should be used in preference. There is an advantage in producing fruit and vegetables at the same time, both for consumption and for sale. Fruit production on the edges or in the middle of vegetable plots is therefore tending to expand. Pay attention here also to select quality seedlings from the good varieties found in nurseries or wholesalers and to call on advice from specialists rather than looking for cheap shrub seedlings. It is also important to remember that apart from a few rare shrubs like bananas, fruit trees only start producing after three or four years. Until then there will only be maintenance work and watering costs and no income. A good solution is therefore to sow and harvest market garden produce around these trees and thus irrigate fruit and vegetables at the same time. 1. Paying regular visits to local markets to look at the produce sold there and their prices. 4. drawing up a production schedule based on this information but above all on what sells well and not just what you know how to produce. In the case of collective vegetable plots, it is important to agree in advance on whether the produce will be sold individually or collectively and, in the latter case, by whom and how. -If you wish to make an income from a garden, the most important thing is not producing but being capable of selling your production in good conditions. -It is preferable, without exceptions, to sell fairly common produce rather than produce that is not found in the local markets. There is undoubtedly good reason for this which you need to know about. -It is often more advantageous to sell your produce on site rather than in the market, even if you sell it cheaper. Firstly, you avoid some expenses (transport, market stall cost, losses) and secondly, price reductions and freshness are a good way of attracting customers. h) Which irrigation method and water drawing methods should be used ? There are several options depending on the type of garden or available resources ; traditional watering, even clever with a double watering can, although undoubtedly inexpensive, is neither the most convenient nor the most effective. Please refer to the next sheet E 51 for this. It is important to protect the garden from animals, petty thieves and wind. Its diversity and greenery in fact is likely to attract animals, even herds. - or - and this is the most effective solution that lasts and protects the garden from wind - plant a hedge, with prices varying according to the type of plants (and it must have additional fencing or wire netting whilst it grows), or install windbreaks. The main advantages of this technique are both economic and social. Market gardening crops help to improve the food of populations, provide them with additional revenue and give them greater food autonomy. At the same time, these community projects have a huge impact of social cohesion within communities. However, the multitude of recommendations made in this sheet show that market gardens are not as easy to create as is sometimes thought ; it requires tremendous effort, patience, organisation and a sense of teamwork, but can bring, ultimately for little cost, a great deal of satisfaction and many very useful resources. They will only really be successful if they are well managed, usually at community level, but also if all the members really gain something from it. The costs depends very much on the organisation chosen for the production, the pumping system used to bring the water and the irrigation technique chosen. The amount normally nevertheless turns it into a project of very reasonable cost and quickly depreciable, without taking account of their economic and social benefits for the village. See also the cost of this equipment in the next sheet E 51 "Irrigation means". - GRET : "Water for market gardening", Guide (1994) intended for anyone wishing to install or improve their irrigation system. Authors : Luc Arnaud and Bernard Gay Editions du GRET (45 bis avenue de la belle Gabrielle, 94130 Nogent sur Marne).